New Congressional Authorization for the Use of Military Force (AUMF) to Give Trump Greater War Powers. Will It be Adopted? On September 14, 2001, three days after the mother of all false flags, congressional members near unanimously passed the Authorization for Use of Military Force (AUMF) – signed into law by GW Bush. 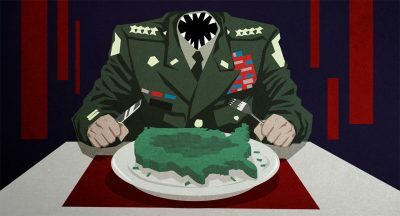 The measure launched endless US wars of aggression, smashing one country after another, no end of it in sight, new nations on Washington’s target list to attack. The 2001 AUMF granted presidents authority to use all “necessary and appropriate force” against designated nations, groups or individuals. AUMF is flagrantly illegal. Only Security Council members may authorize war by one nation against others – in self-defense alone if attacked or if one is imminent, never preemptively. No nation attacked America since December 7, 1941. None threatened it since WW II ended or now. The war on terrorism is a colossal hoax. Washington uses it to wage permanent wars on humanity. With or without AUMF authorization, all sovereign independent nations are vulnerable, on Washington’s target list for regime change. Earlier or proposed AUMF legislation has nothing to do with combating ISIS, al-Qaeda, or other terrorist groups Washington created and supports. US administrations invent pretexts to wage endless wars on humanity, risking eventual catastrophic nuclear war. It requires the president to report to Congress within 48 hours of launching military action. House and Senate members would then have 60 days to review the action – either authorizing it or calling for it to end. New AUMF authority would be congressionally reviewed every four years – updated, restricted or expanded. Since WW II, Congress never halted US aggression once begun, warmaking authority left to the president. It requires presidents to notify Congress within 48 hours of committing armed forces to military action, forbidding armed forces from remaining for more than 60 days, a further 30-day withdrawal period granted – no longer without congressional authorization. If enacted into law, new AUMF legislation will grant presidents authority to continue waging endless wars of aggression – its restrictive-sounding language not limiting what administrations wish to do. Past is virtually assured to be prologue. The 2001 AUMF launched endless wars of aggression still raging in multiple theaters. A new war powers authorization will be a blank check for presidents to wage war on any nations or groups with a stroke of a pen or a verbal OK. The proposed AUMF would limit congressional power to restrain presidential war powers by requiring a veto-proof two-thirds majority to block it. Historically, Congress has overridden less than 10% of presidential vetoes. America illegally, immorally and unethically operates as a global policeman – self-authorizing judge, jury and execution powers. A new AUMF would rubber-stamp presidential authority to wage virtually unrestricted naked aggression on humanity, including at home against designated individuals or groups. US-led aggression in Syria last week, supported by most congressional members, (overwhelmingly by media scoundrels), was a shot across the bow for much more to come, anywhere globally where presidents wish to target – facilitated by a new AUMF if enacted.